In medium bowl, sift together flour, baking powder, salt, sugar, and ground anise. In a second bowl, whisk together egg, milk and butter. Stir into flour mixture until combined. On a lightly floured surface, gently knead until dough is smooth and elastic. Shape into balls about 1 1/2 inches in diameter. Cover and let rest 15 to 30 minutes. (Dough may be refrigerated overnight, if necessary.) Preheat oil in Presto® electric deep fryer. If using an adjustable thermostat deep fryer, set at 375°F. Roll each ball of dough into a thin disk, about 4 to 5 inches wide. Fry one disk at a time, until golden, about 2 minutes, turning frequently. Remove from oil and drain on paper towels. Sift sugar, anise, coriander, cinnamon and cloves together. 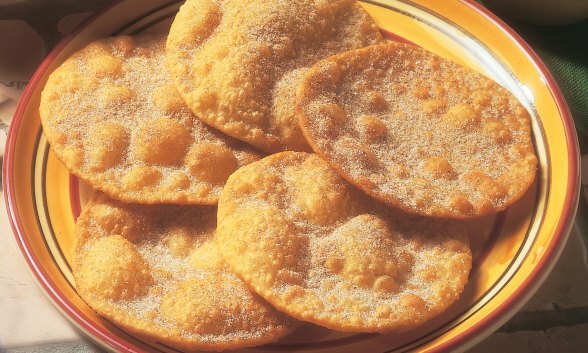 Sprinkle Buñuelos with spiced sugar mixture while still warm and serve.